in partnership with NT Tourism. 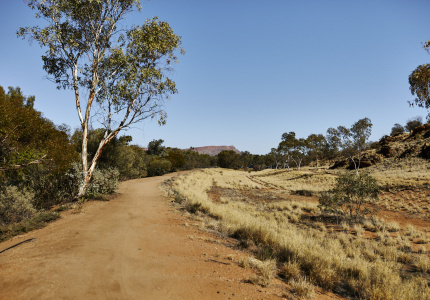 There’s more than one way to get around the red centre. 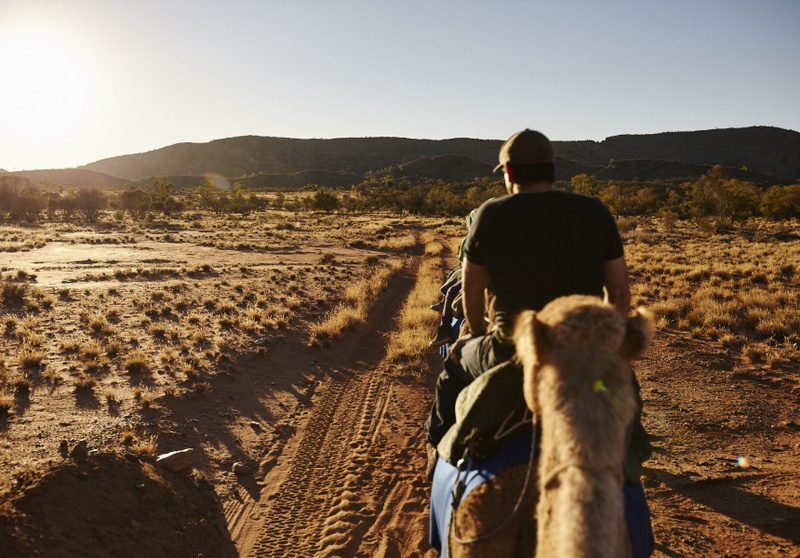 In partnership with NT Tourism, we climb aboard a “ship of the desert” and talk to the man that owns them. “Hold on tight this camel gets up really fast,” says my cameleer, Kat. I’m sat on Sparky, a dromedary, or one-humped camel, with my feet in stirrups and gripping a metal bar at the rear of her hump with a level of tension not demonstrated since a trip to Dreamworld as a child. Leaning back as instructed, Kat signals “hooshta, hoosh” and Sparky stands up. Back legs unfurl, then front, and suddenly I’m almost two metres in the air. We’re at Pyndan Camel Tracks in Ilparpa Valley, a 15-kilometre drive from Alice Springs. 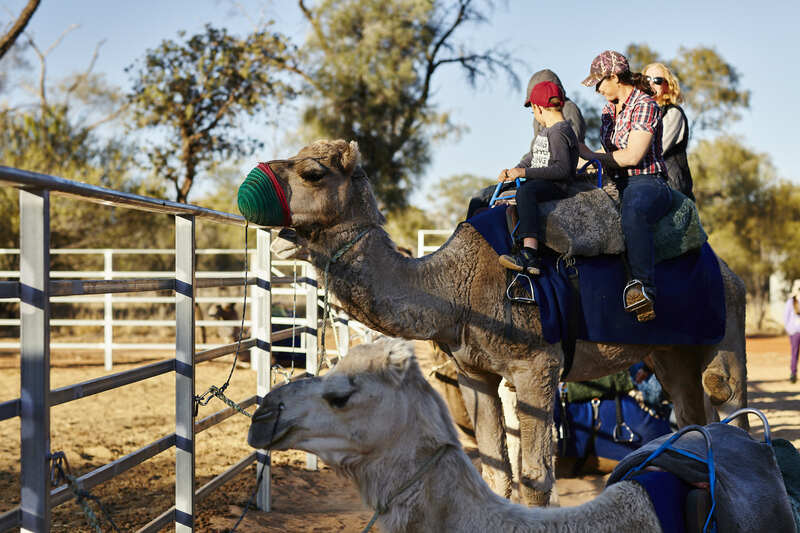 It’s the only camel farm in Mparntwe, as the city is known to the Arrernte peoples of Central Australia. 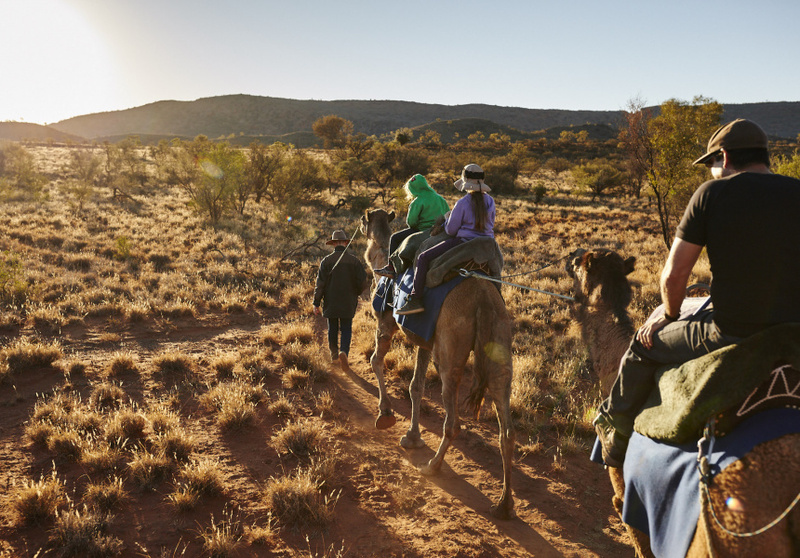 As the sun descends, we embark on a ride out of the farm’s yards to crawl past iron bark and mulga trees, cross claypan flats , and climb a slight incline to sweeping views of a sunset-cloaked West MacDonnell Ranges and Temple Bar Gap. The tour moves at a slow, meandering stride, a calming introduction to this desert trip. Trying to relax into Sparky’s sway is more than just moving in sync with the animal’s rhythm. It’s also about shaking off the tensions of life back in Melbourne and sinking into something akin to a local pace. Marcus Williams is “The Camel Man” behind Pyndan Camel Tracks. He’s built the business from the ground up over 30 years. “I started this business with zilcho,” he says. “I didn’t even own a car.” Williams grew up in country Victorian town with not a lot going on. “If I had have stayed, I’d have probably ended up in jail,” he says. So in 1982, at the age of 18, he set off on his first solo adventure, hitchhiking to Broome. There he “met a guy”, a cameleer, who taught him about these intriguing arid animals. Williams soon left Western Australia for the Northern Territory, where he’d heard wild camels were prolific. After a station manager told him to follow camel tracks into the desert, Williams caught and tamed one. He was 21 years old. “I started off with two camels and ended up with about seven,” he says. He’d sleep under the stars or set up a transient “bush camp”, making a hut from natural materials and even invite his mum out for tea. “I’ve been to extraordinary places,” he says. “Places no white fella would have ever been. There were no satellite phones or mobile phones, I was navigating by the stars and maps. But Williams longed to share his experience. One day he walked his camels out of the desert and into an Alice Springs pub to ask if anyone wanted to go for a multi-day camel trek. Pyndan Camel Tracks was born. Sparky doesn’t like to toe the line, which I’m enjoying. We’re three camels back from the lead camel, connected by ropes. She keeps jutting out to the sides trying to stealthily overtake. Or perhaps find an uninterrupted view. The mother and daughter on the camel behind me seem to find this rebelliousness unacceptable, but I’m amused. It’s not until the end of the ride and I dismount that Kat will tell me Sparky is their newest recruit and has only just started giving rides. 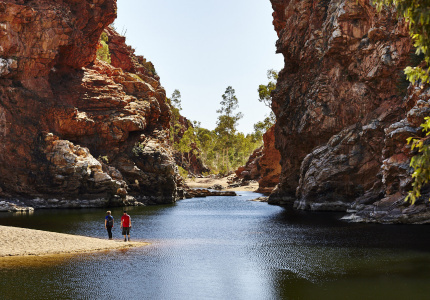 We traverse White Gums Station where tiny wildflowers coexist with spiky shrubs and last wet season’s rivers are dried arteries carved into red dirt. These sandy flats are home to wallabies, dingoes, lizards, birds and more. We spot a goanna, the first sighting for our second cameleer Kodi, and a handful of kangaroos as the sun begins to drop behind the ranges. The surrounding rocky hills are bathed in a deep ochre glow. Camels have been in Australia since the 1840s. They arrived in Australia from the likes of Afghanistan, Pakistan, India, Egypt and Turkey, with more than 10,000 shipped between 1860 and 1907. They were used for desert exploration and were vital in constructing the Overland Telegraph Line, establishing communication between Adelaide and Darwin, and in turn, overseas. But from the 1920s motorised transport began replacing them, resulting in a quick-to-multiply wild population. Today we have those original cameleers to thank for the fresh dates we snack on after the ride. The original cameleers would bury the pips of dates they ate as they travelled, sprouting date palms throughout the region. Soft and sweet, they’re now cultivated by the Desert Fruit Company, a sustainable farming co-operative south-east of Alice Springs. After I dismount, Sparky is relinquished of her saddle and appears to happily trot off to enjoy a feed with the other camels. Williams joins Kat and Kodi in answering our group’s camel questions. With a woven camel-themed strap tied around his Akubra, Williams is a quiet, gruff sort of man. But stories pour out. I ask if he still goes off exploring like he did when he first arrived here. “I’m 53 years old,” he says. “I’ve spent almost 20 years living in a swag in the bush. I don’t need to be doing that now. I try to encourage other people to do stuff like that.” Thanks to Williams, you can. 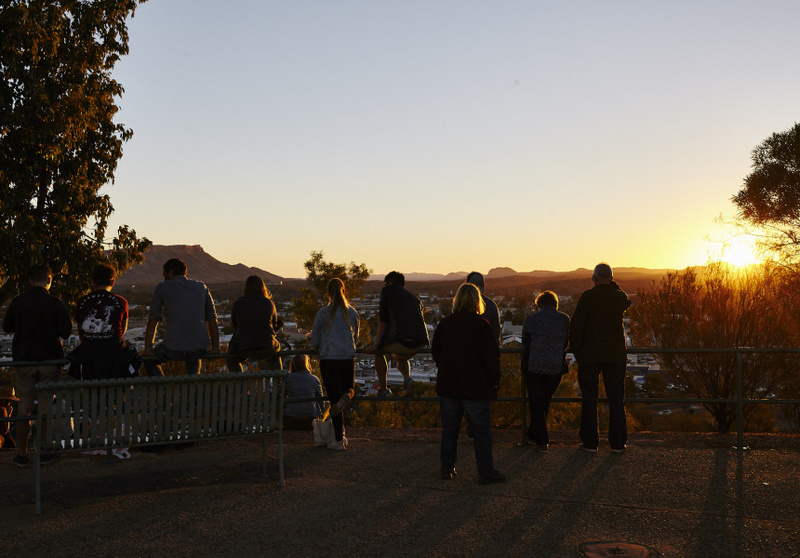 This article is produced by Broadsheet in partnership with NT Tourism. in partnership with NT Tourism. Learn more about partner content on Broadsheet.